hallath is an M5, a small computer just slightly larger and heavier than a Spectrum. 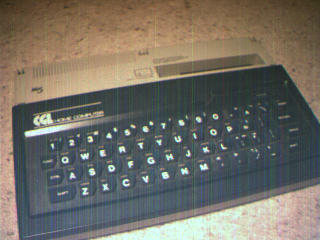 It has a nasty rubber keyboard and Spectrum-style one-key-one-BASIC-keyword shortcuts (although unlike Spectrum BASIC, the builtin BASIC allows you to type the keywords in full if you prefer). 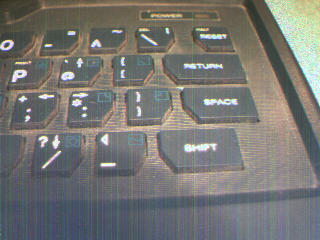 The keyboard's biggest failing is the fact that the 'spacebar' is in fact a space key just under the return key. hallath came with a BASIC cartridge and a game cartridge (Guttang Guttong, a sort of arcade puzzle game involving a train on a sliding blocks puzzle). The cartridges are essentially just ROMs that plug into an edge connector. It uses a separate power supply brick to provide regulated +5, +12 and -12V supplies. hallath used to be owned by a friend. Like tegath and serith it is essentially a home computer that got left behind by the remorseless advance of technology. The video modulator is the box at top left. 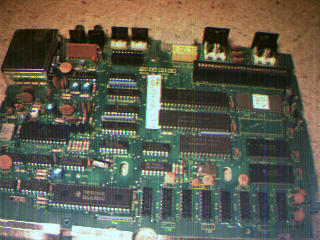 The RAM is bottom right, and there is a TMS9929 to the left of that. On the right hand side is an EPROM, a blank space and two ROMs. To the left of that is a custom IC, the Z80 CPU and a Z80 CTC chip. This page written by Peter Maydell (pmaydell@chiark.greenend.org.uk).